I do it. All the time. I look at a book cover with the same kind of instant appraisal as I do when choosing a bottle of wine based on its label art – which is to say, I already have formed an opinion of its quality while also being fully aware that what’s inside probably bears no relation. But I still do it, and that snap judgement still colors my decision-making process despite my rational acknowledgement of its unfairness. I’m sure I’m not alone in this. So when I set myself to the task of deciding what my book cover would be I knew it would be an important decision. In many ways the actual book makes little difference if the cover art or book summary or any other of a number of promotional materials don’t inspire readers to actually read it in the first place. I thought about the books I love reading now and loved reading as a child. Many of them were written in the heyday of paperback fiction, fantasy in particular, when unique hand-painted cover art was the norm. The cover art was truly art on its own, a visual expression of the book, its message, characters and the general feeling of it all. I wanted a cover that did all of this but I felt uncertain how to go about it, who to ask and how to commission one. Then, by chance, I met Amelia Royce Leonards in her shop in Rockport. Turns out the way to commission a book cover is as simple as not being a self-entitled douchebag when approaching the artist you want to work with – who knew?? Apparently not everyone knows this one weird trick, so I thought I’d share my gems of wisdom. Through the course of roughly a thousand emails and text messages we hashed out the details of the cover design. 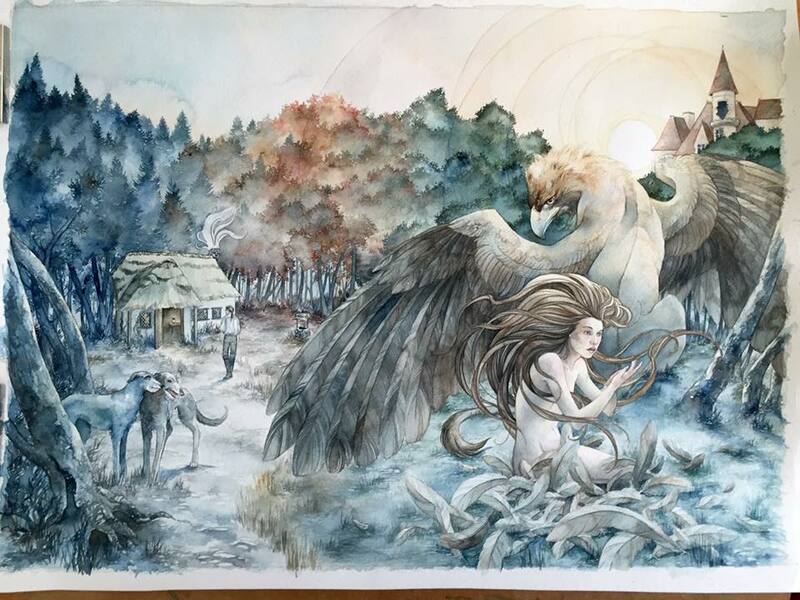 I knew from the beginning that I wanted to show my Beast in both her bestial and human forms as the focal point of the cover, so deciding how they would be portrayed was the hardest part. Turns out my inconvenient imagination which provided two characters of such extreme differences in size meant that having them share a relatively small space was going to be … challenging. I’ve promised Amelia that my next book will be the story of the unlikely friendship between a mountain and a fly, just to keep her from resting on her laurels. After that was finally settled everything else kind of just came together easily. 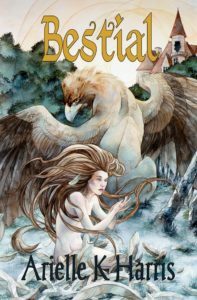 The cover tells the story, moving from right to left – seasons change from spring/summer to autumn/winter, Yvaine transforms from Beast to Mortal, and Beau walks towards his fate. Anyone wishing to get in touch with Amelia, or see more of her fantastic artwork (in both senses of the word “fantastic!”) can visit her Facebook page or Etsy page. I’m both excited and terrified to shortly release this novel into the world. What started out as an interesting exploration into one of the archetypes of fairy tale relationships, which requires that one or both of the characters must undergo a crucial transformation before its actualization, became something significantly more personal over time. When we write what we know it becomes inevitably personal. When what we know is pain and heartbreak, that thing which is personal becomes harrowing. This book has been a trial and a catharsis. I don’t believe I’ll ever read it again once it’s been published. Only the imagination can get us out of the bind of the eternal present, inventing or hypothesizing or pretending or discovering a way that reason can then follow into the infinity of options, a clue through the labyrinths of choice, a golden string, the story, leading us to the freedom that is properly human, the freedom open to those whose minds can accept unreality. For many, accepting unreality is a blessing. Most people come to read fantasy to escape their reality and that’s certainly what attracted me as an over-dramatic pre-teen, when my love of the genre began. So there’s an element of irony to the fact that my first published work of fantasy has forced me to confront my own reality rather than provide escapism from it.